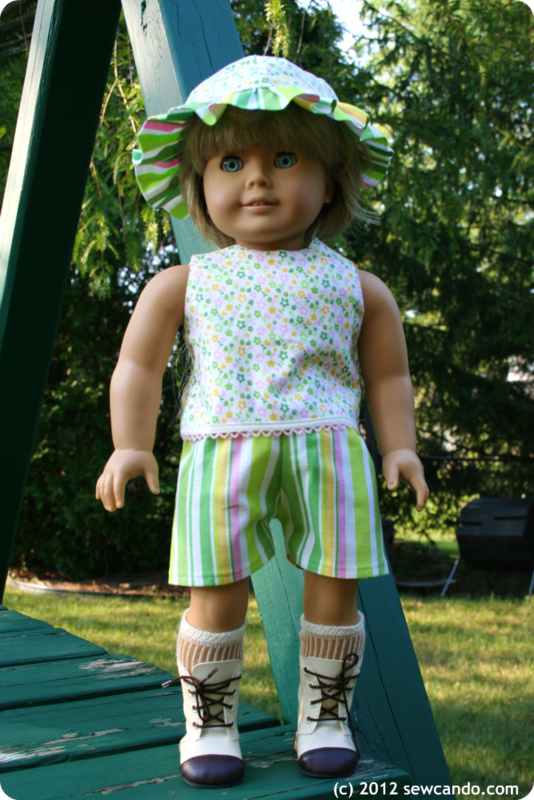 Sew Can Do: Rosie's How To Make Doll Clothes Course Review & Giveaway! Rosie's How To Make Doll Clothes Course Review & Giveaway! Today I've got a really special review & giveaway to share: Rosie's How To Make Doll Clothes Course & Patterns. 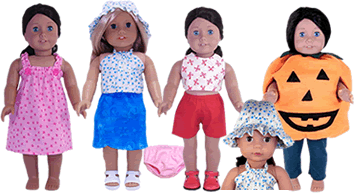 Rosie has created a complete online video course to teach all the ins and outs of sewing doll clothes in addition to a range of cute doll clothing patterns. Rosie asked if I'd like to review her program and the timing was great. My daughter is getting really interested in dolls. She loves the Kirsten American Girl doll from my childhood days. It's one of the very first ones made (numbered and hand signed by the original founder Pleasant T. Rowland), so it's special to us both. I remember pouring through the catalogs as a kid and, even back then, recognizing that those outfits were expensive! I loved the idea of making some myself and adding my own personal touch, so I gave it a try. The Online Sewing Course is set up in themed sections with easy-to-watch segments that are just a few minutes long, so you can watch at your convenience. Even if you don't know a thing about sewing, you'll find the knowledge you need in the videos. Setting up a sewing room, supplies, even fabric info - it's all in there. Plus lots of visuals and explanations, so it's like having a friend showing you as you go. And if you're experienced at sewing, this course still has a lot of great info. I learned that the approach to sewing doll clothes is a lot different than sewing normal clothes. If I'd just tried to make some doll clothes based on what I knew beforehand, I'm pretty sure it would have been a lot trickier and less fun. Rosie shows how to assemble things in a different order, plus ways to get around the tiny size challenges to keep it frustration-free. I had a number of "Oh I never thought of that!" moments. There are special segments called Cool Tips that share some great shortcuts & extra info that are really handy too. 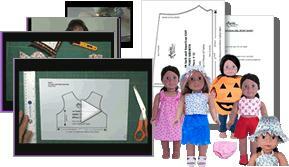 The course also came with 8 free doll clothing patterns that had both printable instructions AND videos for making them. Totally goof-proof. 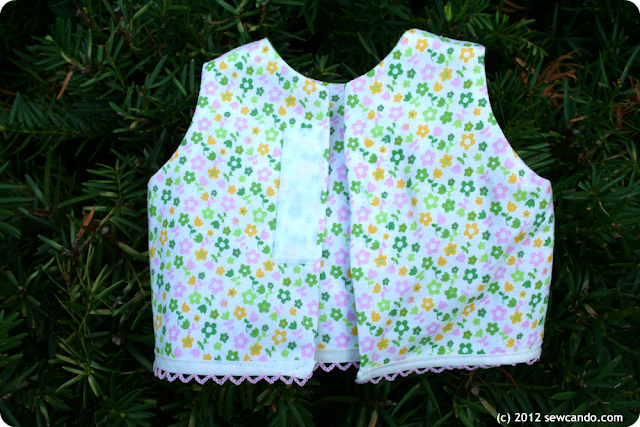 The tank top is fully lined and has a practical velcro closure to make it easy for little hands to put on/take off, which I really like. I added some special bias tape to the hem for some detailing. Another nice thing about Rosie's course is it gives tips and ideas for using all sorts of trims and add-ons to make lots of different looks with all of the basic patterns. I really like being able to get creative with the details to personalize it myself. After seeing how nice these turned out, I've definitely gotten the bug to make more doll clothes and with the online course being accessible for 12 months, there's plenty of time. Rosie also offers the option to buy the whole course on DVD for anyone who prefers that too. There's a huge savings to making them yourself and being so easy & fun it's definitely worth it! + 8 Doll Clothing Patterns? 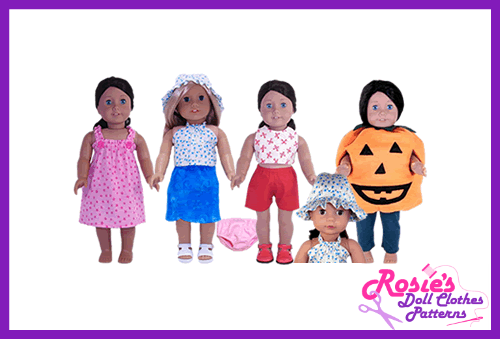 Like Rosie's Doll Clothes Patterns on Facebook and come back to leave me a comment saying you "Liked" it. Be sure to include an email address if it's not on your profile. Giveaway will be open until 11:59PM EST August 9th, 2012. GIVEAWAY CLOSED. Open to entires worldwide. Void where prohibited. The winner will be chosen at random and announced later that week. Good Luck Everyone! Nice Blog and I also like Rosie! linked to my fb! thanks for the opportunity to enter (many times! lol) this comp!! 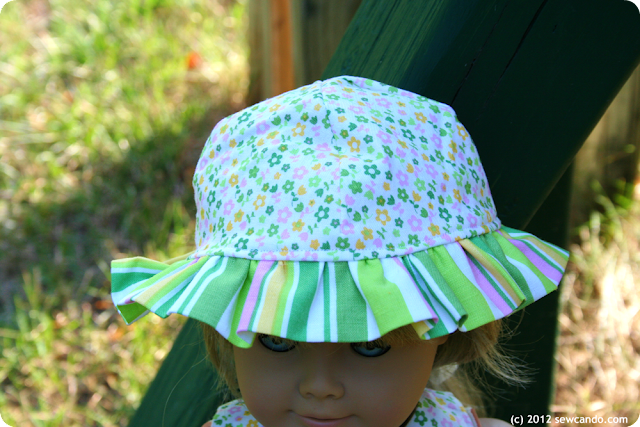 My favorite Rosie pattern is the handkerchief top. Pick me! I liked you on FB!!! 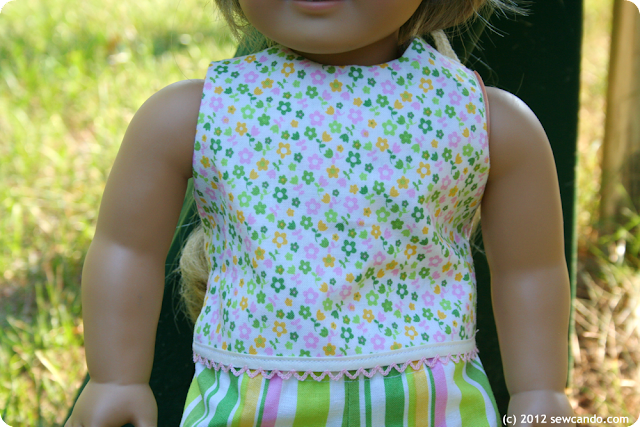 My favorite pattern from Rosie's website is the fir trimmed jacket for the cabbage patch. Looove it! Followed Rosie's blog on FB! I follow Sew Can Do! Liked Sew Can Do on FB! Already following Sew Can Do on Pinterest. Already following Sew Can Do. My girls would love me and would make great birthday and Christmas gifts for them. I liked Rosie on Facebook. Just stop by her website we love the cute fairy costume. I liked it on FB.